Pugh’s first novel is a magnificent achievement. Let us hope he returns to enthral us with another very soon. The Otiosi? As far as Mathew Longstaff knows, they’re just a group of harmless scholars with an eccentric interest in the works of antiquity. When they ask him to travel east, to recover a lost text from Ivan the Terrible’s private library, he can’t think of anything but the reward – home. A return to England and an end to the long years of exile and warfare. 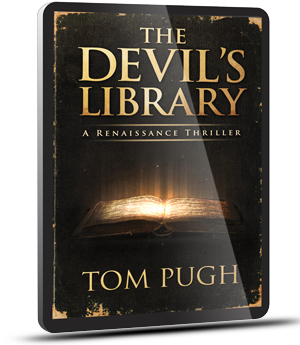 But the Otiosi are on the trail of a greater prize than Longstaff realises – the legendary ‘Devil’s Library’. And they are not alone. Gregorio Spina, the pope’s spymaster and chief censor, is obsessed with finding the Library. It’s not the accumulated wisdom of centuries he’s after – a swamp of lies and heresy in his opinion – but among the filth, like a diamond at the centre of the Devil’s black heart, Spina believes that God has placed a treasure, a weapon to defeat the Antichrist and pitch his hordes back into hell. Only Longstaff, together with the unpredictable physician, Gaetan Durant, can stop Spina using the Library to plunge Europe into a second Dark Ages. The two adventurers fight their way south, from the snowfields of Muscovy to the sun-baked plains of Italy, where an ageing scholar and his beautiful, young protégé hold the final piece of the puzzle. But is it already too late? Can the four of them take on the might of the Roman Church and hope to win?